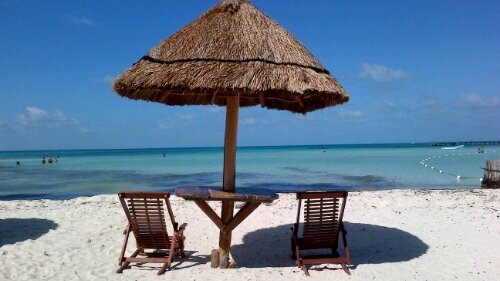 La Isla Mujeres (Island of Women) is a great alternative to the more cosmopolitan Cancun. It’s a short ferry ride from one of the many ferry docks in Cancun. The ferry ride alone is worth the trip. La Isla Mujeres is a small island that you would have no problem exploring on foot. However many people rent golf carts for the day to get around th island. You’ll find everything you need here. There’s bars, restaurants, stores and hotels. It’s actually very quaint. Most people come for the beach or diving. It’s a popular home base for divers. I came for the beach. The water here is much more tranquil than in Cancun. It’s like a giant wading pool and the water is crystal clear. 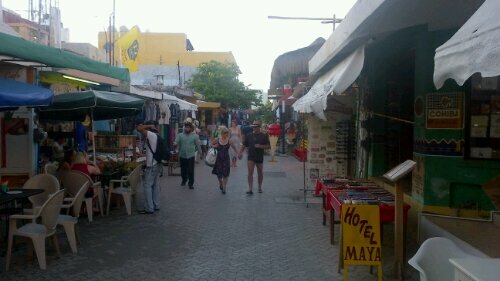 The shopping at La Isla Mujeres is pretty much like the markets of Cancun or Playa del Carmen. Lots of surf shops, t-shirt shops and trinkets for the tourists. You will find lots of massage and yoga establishments. There’s lots of places to get a massage or go to a relaxing yoga session. Most people come for the beach. 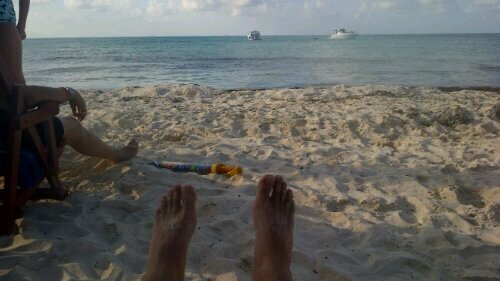 It’s by far worth the trip to La Isla Mujeres. There’s quite a few beach clubs if you want to park yourself with a bucket of beer and table service. There’s nothing quite like ceviche, a bucket of beer and a table by the sea. Prices are reasonable, not like you’d expect. A place like this in Playa del Carmen would be twice the price. It’s a great bargain to be served all day with beer and eats while you sit by the sea, swim, tan and read a good book. Gotta go. Still have a post on Puerto Morelos and one about the Captian Hook pirate cruise to come, so stay tuned.